The six nations affected by a new executive order that prevents their citizens from obtaining new visas to enter the United States for 90 days accounted for 649,932 legal U.S. entries between fiscal years 2006 and 2015. This group includes visitors, students and diplomats as well as refugees and new lawful permanent residents, according to a Pew Research Center analysis of government data. Diplomats, U.S. lawful permanent residents, dual nationals who use a passport from another country and refugees already scheduled to travel to the U.S. are among the groups exempt from the travel restrictions. The president’s new order will also temporarily halt the U.S. refugee resettlement program for 120 days. Previously, citizens of the six restricted countries were able to legally enter the U.S. in several ways. Official data are available on three categories of legal entrants: temporary immigrants, refugees and new lawful permanent residents. Government data are unavailable for those who entered as naturalized U.S. citizens, dual nationals (citizens of any two countries) or U.S. lawful permanent residents after their first entry into the U.S.
Over the same period, annual refugee admissions from these six countries fluctuated, but about the same number entered in fiscal 2006 (15,035) as in 2015 (15,243), according to U.S. State Department data. The annual total jumped for these six countries, to 26,842 in fiscal 2016, a year when 12,587 refugees were admitted from Syria alone. In all, 110,003 refugees from these six countries were admitted between fiscal years 2006 and 2015, representing nearly two-in-ten (18%) of all refugee admissions during the period. 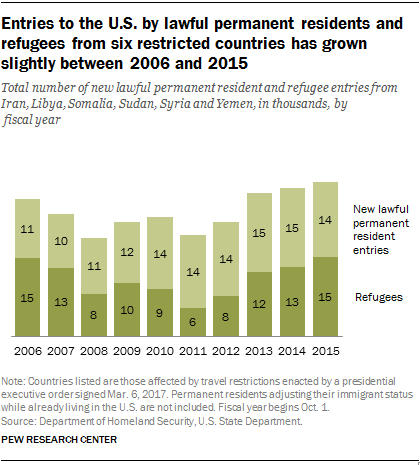 The annual number of new lawful permanent residents entering from Iran, Libya, Somalia, Sudan, Syria and Yemen also increased between fiscal years 2006 and 2015, from 11,392 to 14,397 arrivals. This is a group that can include family members of U.S. citizens and awardees of the diversity immigrant visa program. In all, 130,480 people entered the U.S. between 2006 and 2015 as new lawful permanent residents from these six nations, with nearly half (53%) from Iran. Of the six restricted countries, Iran had the largest total number of legal entrants into the U.S. (310,182) between 2006 and 2015. Two-thirds (67%) of these entrants arrived in the U.S. on temporary visas. Syria had the second highest number of entrants (124,708), with 85% arriving on temporary visas. Meanwhile, 86% of Somalia’s 72,652 entrants during this time were refugees.